2014 Kawasaki KX65 Specifications and Features - Powered by a liquid-cooled engine, 2-stroke, single cylinder, 64cc, which produces responsive power, Kawasaki KX65 is a competition bike that has been furnished by the features hi-tech and has been proven in the world of racing. For more than 30 years, Kawasaki’s smallest KX™ motocrosser has played a key role in the sport of motocross, providing a race-winning platform on which countless national and world champions have begun the journey to superstardom. 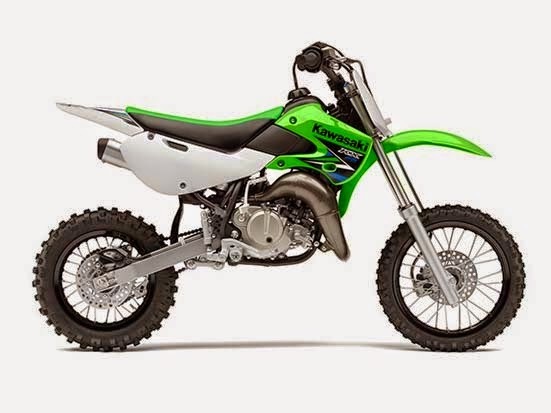 Today, Kawasaki’s KX65 maintains the same successful attributes, including a powerful and reliable two-stroke engine, lightweight chassis, disc brakes and long travel suspension. Its reputation as the quintessential learning tool for young racers taking their first steps into the world of competitive riding is well deserved. 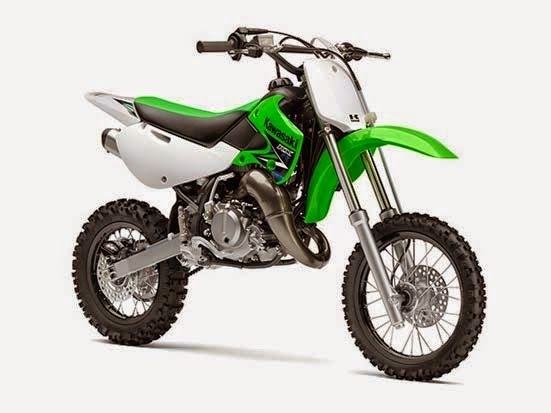 The Kawasaki KX65’s liquid-cooled, 64cc engine produces an amazing level of power for its small displacement, and its smooth-shifting six-speed transmission and manual clutch help transfer that power to the ground efficiently. Its semi-double-cradle steel frame is equipped with Kawasaki’s legendary Uni-Trak® linkage system, which alters leverage on the rear shock as the suspension is compressed, so that small bumps receive light damping and larger bumps receive progressively firmer damping for a smoother ride and better control. Both the shock and fork boast four-way adjustable rebound damping for optimal handling. Lightweight aluminum rims reduce unsprung weight to help improve suspension action, and offer the same aggressive look as the rims on the larger KX models. Both wheels feature hydraulic disc brakes that not only provide great stopping power but require little maintenance and simplify wheel removal. Younger riders who race their 2014 Kawasaki KX65 at designated events are eligible to receive support from Team Green™, Kawasaki’s amateur racing support program. For more than three decades, Team Green has provided regional support vehicles and highly trained technicians at more than 100 events per year throughout the United States, offering technical information and assistance to those who race Kawasaki products. Kawasaki also offers a comprehensive contingency program for amateur and professional riders who place well at designated events. Authentic Kawasaki Accessories are available through Kawasaki dealers. Rake/Trail : 27 degrees / 2.4 in. Front suspension / wheel travel : 33mm leading axle conventional fork with four-way rebound damping / 8.3 in. Rear suspension / wheel travel : Uni-Trak® single shock system with four-way rebound damping and fully adjustable spring preload / 9.4 in. Overall length : 62.6 in. Overall width : 29.9 in. Overall height : 37.6 in. Ground clearance : 12.0 in. Seat height : 29.9 in. Curb weight : 132.2 lbs. 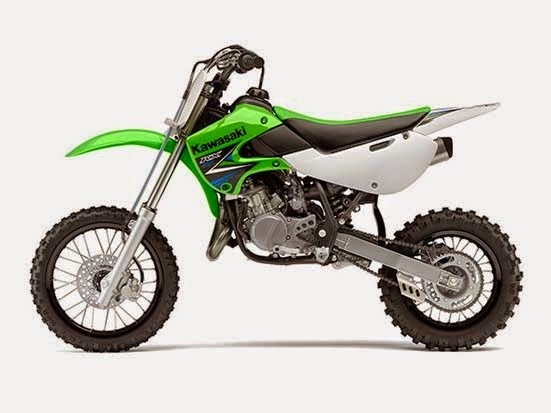 Thus reviews regarding Specifications and Features Kawasaki KX65, concerning the price and specifications taken from the official website of Kawasaki. thank you and hopefully useful.